¶ Why are the sun and the moon (a different object of size) piled up to just agree? In the sun, about 400 times are big from the moon and almost look like isometry because they are about 400 times of distance of a month away from the earth. There is a reason in what used words "about", to "almost" say, and a perihelion approaching the sun most averages the earth, and it is it every year on January 4. The orbit where the earth revolves is going to become an oval a little, and this depends. On the contrary, the most far-off aphelion is neighborhood every year from the sun on July 2. As for the size of a month, about approximately 10% size changes for an oval orbit revolving on the earth by around 15th. 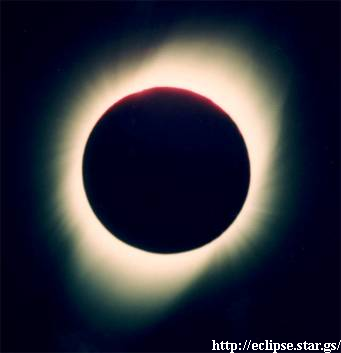 In addition, the golden ring solar eclipse or total eclipse of the sun is taken whether you are near to size and the sun of a month whether it is long. 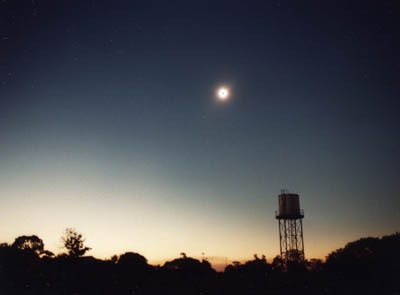 When the moon is greatest, and the earth grows big in the neighborhood of aphelion, a total eclipse of the sun of 7 minutes 30 seconds is seen at the maximum. 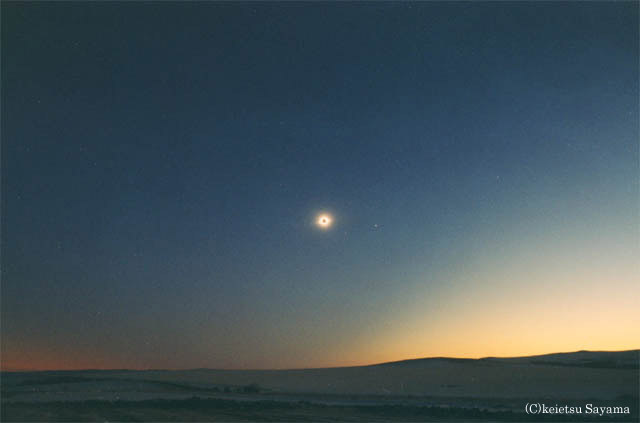 A golden ring solar eclipse nearby is seen in the case of reverse at the maximum for 12 minutes 30 seconds. Solar eclipse 1000 to this limit is seen once a year. 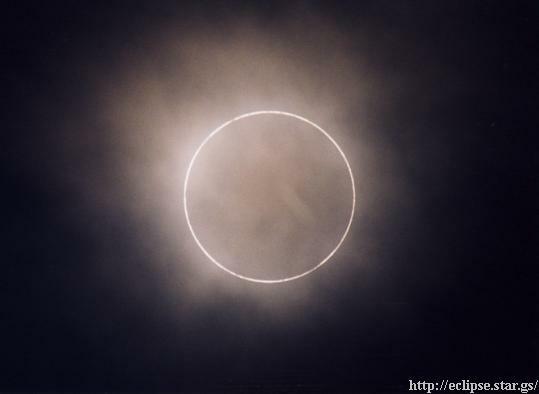 In addition, a golden ring total eclipse of the sun is considered the sun and size of an appearance of a month just agree, and to become size of degree. This is frequency to say once in 20 years. § A photograph became such a wind! Because the timing when this projected a diamond ring was delayed, a diamond grew too big. If a timing is just correct, I am reflected. 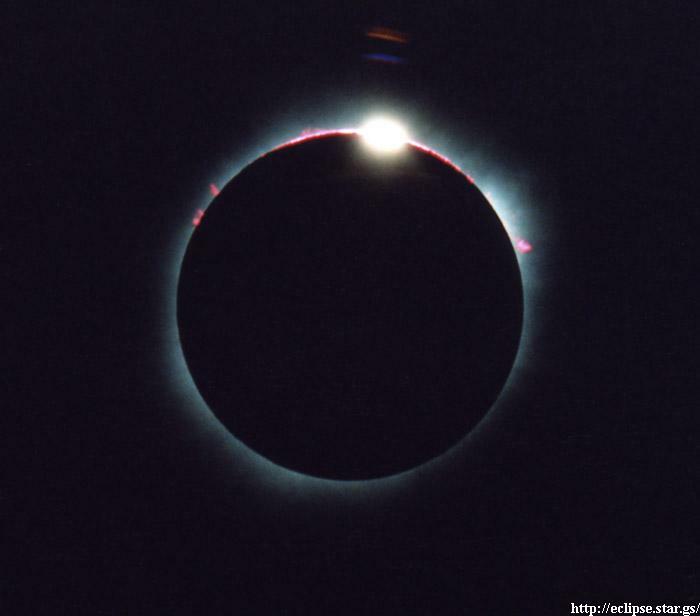 ∇ When is a solar eclipse seen where? It is considered that I follow the date when a solar eclipse was generated in a ratio once in a half year. 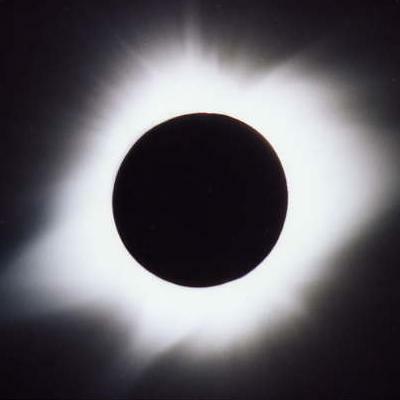 In addition, a total eclipse of the moon or partial eclipse of the moon / a penumbra eclipse of the moon is generated by all means on around 15th of a solar eclipse. It is a place, but it is it once during 300-400 years if I look without I squeeze it in one point on the earth, and moving. 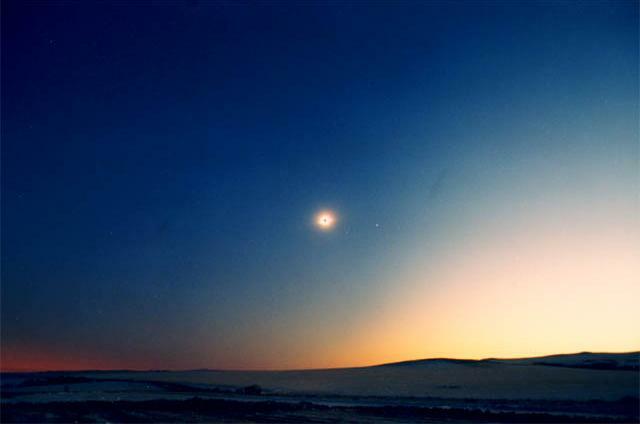 If only Aomori pref in JAPAN says, a total eclipse of the sun is not generated from June 3, 1742 to August 24, 2063. In fact, the frequency that a total eclipse of the moon is seen in is low. 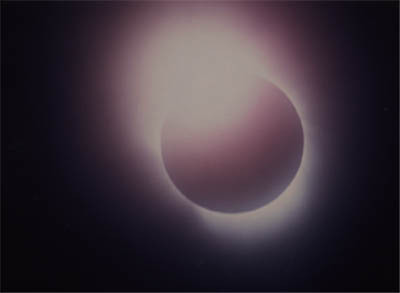 A total eclipse of the sun is the phenomenon that is very rare because I am not seen unless I am in a falling shadow of the new moon whereas I am seen somewhere if an eclipse of the moon is the night on the earth. 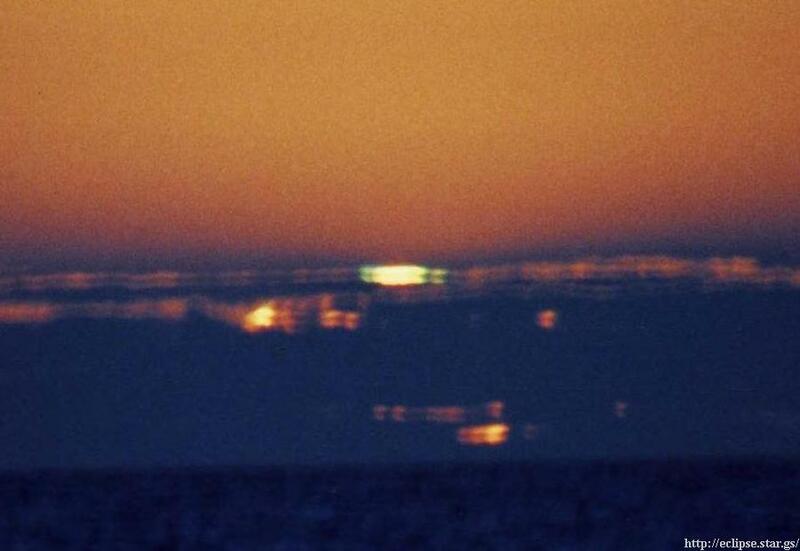 ◊ What is a green flash bulb? When the atmosphere watches the morning sun or the setting sun at the time of very clear state, a hemline is a phenomenon to be seen in green at a moment whether it is an upper edge of the sun. The state does not continue for one second either and is right in a condition that a green flash bulb shined for an instant. It is the phenomenon that it is green momentarily, and do not emit light after a solar part can try to be warped by a refraction phenomenon of the atmosphere, and having lengthened for a long time aside since I become square. Actually only sunset or the sunrise is seen under great strong-minded influence. There is an observation record recently in Noshappu Promontory of Wakkanai city, Hokkaido. 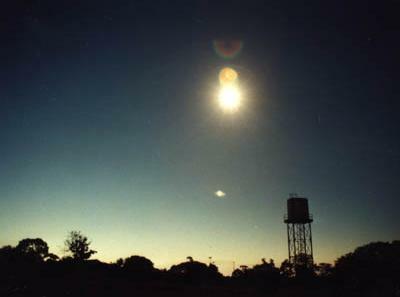 ♦ What is a halo phenomenon of a black drop phenomenon / the Venus? 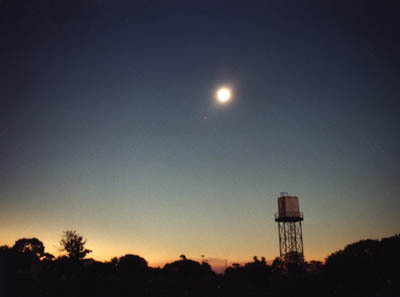 A phenomenon to be seen when Mercury and the Venus pass sun disk. When a joint such as the drop that water drips came in contact with solar inscription, I see it. In other words, at the time of the second contact or the third contact, a planet passing the sun front says a solar relationship and the phenomenon that can try to be connected. It seems that a thing such as a shadow seen like this drop is affected by a shadow band to mention later. In other words a fluctuation of air by difference of temperature of the atmosphere influences it. The state that the Venus passes the sun front without a black drop phenomenon understands that I watch the sun disk passage of Venus or Mercury from the space shuttle which is not affected by the earth atmosphere. ...I wrote, but a black drop phenomenon is not caused if, actually, focus of a subject matches. It is a story former more than the second century that was observed before. It seems that a way is even if focus is generous with a subject in then photograph technology, and a black drop phenomenon happens. At the time of the fourth first contact or contact, I say the phenomenon that surroundings of the Venus which it cannot try to be covered solar light can try to shine momentarily. When the Venus originally is completely covered by the solar inside, I see it, but it is Wake whom the sun lights up the atmosphere of the Venus just after the fourth contact just before the the first contact, and is seen from the earth (the circumference shines like a corona). The earth atmosphere reflects in the surface of the moon, and an eclipse of the moon of the earth looks reddish. 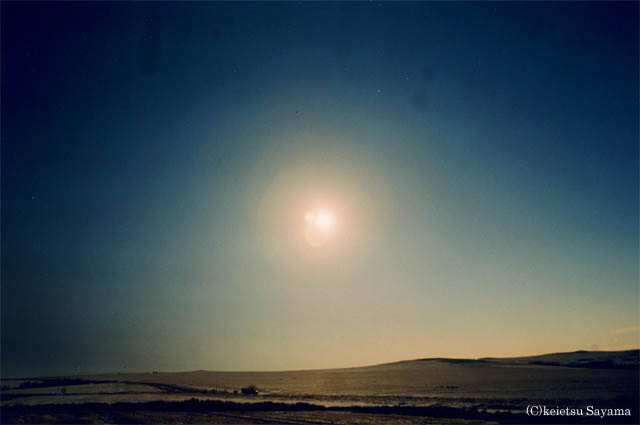 It is a thing same as it, but I shine, and the atmosphere of the Venus can consider concentric circle-shaped light the atmosphere of the Venus to be lighted up like a corona. Besides, this is the very rare phenomenon that it is not considered that there is not it by a moment of the first / the fourth contact by a phenomenon to show when the sun / the Venus / the earth was arranged in a straight line. By the way, Mercury is not seen in a halo phenomenon because I do not have the thick atmosphere such as the Venus. † What is a shadow band? It is a transparent belt-shaped shadow such as the fluctuation that moves the ground just before a total eclipse of the sun while I am short. When the atmosphere that the ground warms, and rose comes in contact with cold air of the sky, I make a border. The solar light that conflicted in the boundary surface reflects it and becomes a shadow of a shadow band. The thing which seems to be the surface of the water floating in a swimming pool is just a phenomenon to be seen to us who are a bottom of a swimming pool. This shadow is seen other than a total eclipse of the sun, but cannot try to be buried among forthcoming severe light from the sun. This is a phenomenon same as what a star can try to blink at. In other words if there is light of a point light source, I see a shadow band without relations for the night and day. In addition, it is not a thing looking be a total eclipse of the sun by all means. Width of all existing obi, speed of a month and temperature of light and shade / observation place of a movement direction / a shadow band of a shadow of total eclipse of the sun duration / a month are the phenomena that I am various, an observation report of the amateur astronomys is expected by a difference of an observation place. It is easy to come to observe it when I spread big white paper and cloth in the ground. You should spread it in an observation foothold as a substitute of a mat. In addition, the state that a shadow band moves on a white wall of an observation place (hotels) is reported. All the shadow bands are the phenomena that they do not understand only by looking at the sun of the existing inside. Because it is a phenomenon to be caused in the sun and the ground of the other side, it is a phenomenon to understand when I do not watch a total eclipse of the sun. ...I think that there is not the opportunity when a shadow band considers that duration of a total eclipse of the sun does not continue for a long time in large measure, though. 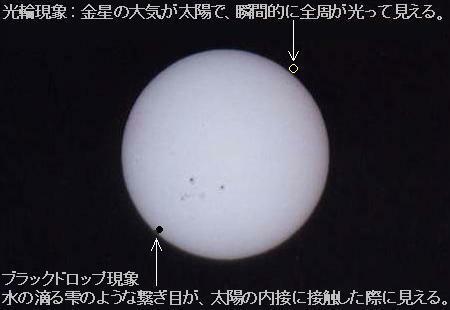 Because Mr. M explains it with a document with a picture in sun beer to a video of a my site, please look at it there. That vanity of a shadow band is different is reported in diamond ring front and back. It is movement of a shadow of the huge moon floating on the earth. Because directions to do in the south of the sun are different in the Northern Hemisphere and the Southern Hemisphere, movement of a shadow of the moon is different in a direction.